Small cap US stock funds have outperformed large cap US stock funds. This small cap stock fund can be very volatile. 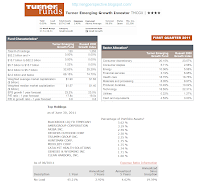 One of the best small growth US stock funds is Turner Emerging Growth Investor fund. Details about the fund review can be found below. The Turner Emerging Growth Investor investment seeks capital appreciation. This Turner Investment Partners fund invests mainly in equity securities of U.S. companies with small and very small market capitalizations and also in securities of companies that are diversified across economic sectors. Its exposure is generally <5% of assets in any single stock, subject to exceptions for the most heavily weighted securities in the 2000 Growth Index. This small growth domestic stock fund is on the top list of Forbes 10th best mutual funds. Frank L Sustersic has managed this fund since its inception in February 1998. This fund has expense ratio of 1.40% per yeary. This expense fee is a bit lower compared to the average in the Small Growth category (1.52%). The total net asset of this fund is $595.72 million. This TMCGX fund is under the management of Turner Investment Partners. Currently it is on 24th rank in the small growth category. The CUSIP of this fund is 872524301. 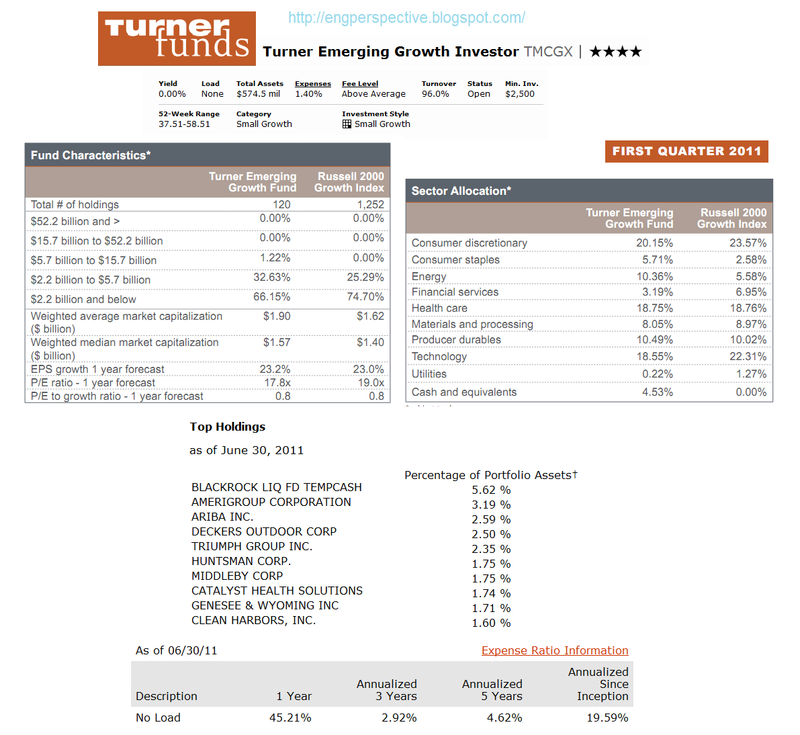 Note: Previously, this fund is known as Turner Micro-Cap Growth fund. This Turner fund has gotten 4-star Morningstar rating. Since 1998, it has performed 10 years of positive return and 2 years of negative return. The best achievement was in 1999 with 144.39%. This best fund has returned 33.55% over the past one year and 8.93% over the past decade. This TMCGX fund has 7.26% YTD return. To start investing in this TMCGX fund, you will need a minimum of $2,500 for brokerage account and $2,000 for retirement (IRA) account. This is a no load fund, there is no 12b1 fee and no sales load fee. The minimum subsequent investment for both accounts is $50. This fund can be purchased from 82 brokerages, such as JP Morgan, T Rowe Price, Td Ameritrade Inc, E Trade Financial, etc. The other class of this Investor class is Institutional Class (TMCOX) that has 1.17% annual expense ratio. As of June 2011, the top ten holdings of this fund are Blackrock Liq Fd Tempcash (5.62 %), Amerigroup Corporation (3.19 %), Ariba Inc. (2.59 %), Deckers Outdoor Corp (2.50 %), Triumph Group Inc. (2.35 %), Huntsman Corp. (1.75 %), Middleby Corp (1.75 %), Catalyst Health Solutions (1.74 %), Genesee & Wyoming Inc (1.71 %) and Clean Harbors, Inc. (1.60 %).